Welcome to the Small Pet Exercise Wheels superstore! Little pets like hamsters, gerbils, mice, rats and others have tremendous amounts of energy bundled up in their tiny bodies, and they need somewhere to let it out! 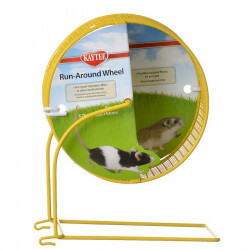 They are too small to run around safely outside of the cage without the risk of getting hurt or lost, but a compact exercise wheel is the perfect solution! Our selection of Small Pet Exercise Wheels offers pets fun and stimulation while inside the cage, allowing them to race against themselves without being an underfoot nuisance. Pet Mountain's Small Pet Exercise Wheels store features top quality products from Super Pet, the leader in small pet care & cage accessories. 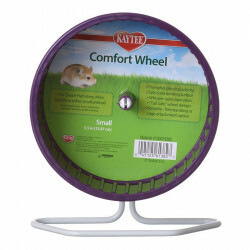 The Super Pet Comfort Wheel features a safe, solid running surface, quiet operation and a "tail-safe" design, allowing pets an easy entrance and exit. Every Comfort Wheel comes with a heavy duty wire stand and a 2-way attachment clip, so the wheel can be used either free-standing or clipped to a wire cage. 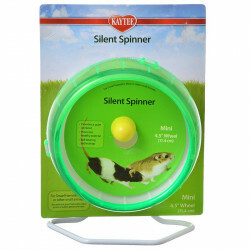 The Super Pet Silent Spinner is the wonderful, whisper quiet workout wheel for pet rats and chinchillas. Patented ball bearing technology makes these wheels super silent. Silent Spinners work two ways: free standing or attach directly to any wire cage. Super Pet Run Around Wheels provide free-wheeling fun for your furry friend! Each wheel is covered in an extra-durable, epoxy-coated surface making them easy to wash as well as rust resistant.